The Offa’s Dyke Centre presents its first ever art exhibition with a collection of Offa’s Dyke inspired paintings by artist, textile designer, lecturer and accomplished sportsman Mick Ward. Mick Ward was born in Essex in the 1930s. An artist, textile designer and art lecturer Mick spent much of his working life in Leicestershire. In his younger days Mick was both a top sportsman as well as an accomplished artist. For thirteen years he worked as a textile designer for Courtaulds and taught at the Bath Academy of Art and then Leicester Polytechnic where he taught textile design and drawing. In 1973 Mick became a published author with Art and Design in Textiles published by Van Nostrand Reinhold. In the 1950s, Mick was also considered to be one of the best cyclists in the country; unusually, he had the rare ability to be able to compete over any distance – and at the highest level. Mick won sprint events on the track at Herne Hill and a number of road races, but it was his achievements in Time Trials which brought him to the attention of the public. This early1950s self-portrait is of a determined young sportsman with clear goals in life. Sixty years ago, in June 1958, Mick won both the 25 mile & 50 mile National Road Time Trial Championships, becoming the first cyclist to win both events in the same year. In cycling terms, these are considered to be ‘short-distance’ events, but in the September of that year, he cycled almost 260 miles to come second in the National 12-hour championships. The following year, Mick won his fourth national title and retired from competitive cycling. During a period that many consider to be a golden era of British Cycling Mick knew and competed against most of the top names including the charismatic Tommy Simpson. 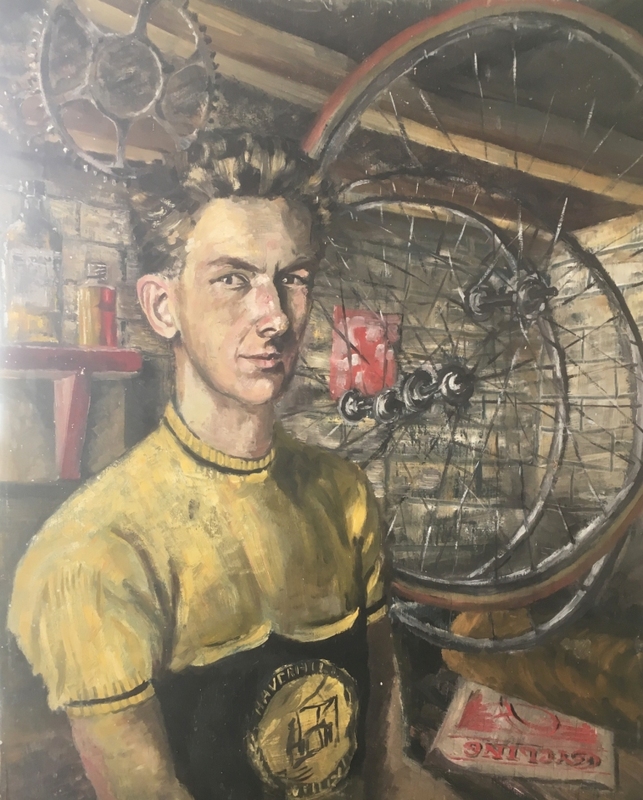 In December 1958, Mick was featured in a five page article, in Sporting Cyclist magazine; he is quoted as saying that “he would much rather be a really good artist, than a really good cyclist”. Mick also excelled at running and for over 25 years, the Offa’s Dyke Path was used for many of his training runs. The training along Offa’s Dyke Path certainly paid off; at the age of 70, Mick was able to run under three and a half hours at the London marathon – winning his age group. In the same year, he went on to win a medal at the World Masters Athletic championships. Sixty years on, Mick’s artwork is featured in an exhibition here at the Offa’s Dyke Centre in Knighton. Now in his 80s, Mick has all but retired from competitive running and cycling, but his love for painting continues undiminished. When he has a spare moment, he can often be found in the vicinity of Offa’s Dyke, taking photos and planning his next piece of work. If Mick is present, he’ll be delighted to chat to you and to tell you what he believes is so special about the unique and wonderful Offa’s Dyke. Mick’s art is on display until the end of August.